I started this blog just over two years ago to share about our family’s journey with healing behavioral disorders. Among my most popular posts are those that highlight our favorite natural treatments for ADHD, but I’ve also written about steps we’ve taken to heal PANDAS disorder. This post shares a little more in depth about what life with PANDAS is really like. It’s been about two years since we learned my son and I both had strep overgrowth in our bodies. Unfortunately, the practitioner we were seeing at the time, though holistically-minded and somewhat helpful, was not experienced in PANDAS and didn’t give us a proper diagnosis… or treatment. I knew from my son’s test results and behavior, however, that it was PANDAS. Not familiar with PANDAS? Let me introduce you. PANDAS is short for Pediatric Autoimmune Neuropsychiatric Disorders Associated with Streptococcal Infections. In short, it’s a smorgasbord of psychiatric disorders caused by a strep infection that settles in the brain. But wait! PANDAS isn’t necessarily caused only by strep, and it doesn’t necessarily only affect pediatric patients. In other words, it’s highly complicated and poorly understood by the majority of medical professionals (the ones that have even heard of it or recognize its existence). How does strep cause psychiatric conditions? When the immune system is not functioning correctly (whether from a previous insult to the system, an environmental trigger, or genetic predisposition), a strep infection can go from being an ordinary childhood illness to a long-lasting disease. In PANDAS children, the infection passes the blood brain barrier, resulting in brain swelling (aka encephalitis) and, eventually, causing the immune system to attack the brain, making the condition auto-immune in nature. Children suffering from the disorder will experience varying degrees, and likely a combination, of the above symptoms and behaviors. My son has every symptom on the above list and more. I knew it was PANDAS from the moment I read about it. While my son has exhibited symptoms of hyperactivity from the time he could walk, his most worrisome behaviors began following an acute illness. Almost six years ago, the kids and I got sick with some sort of respiratory illness. It took us weeks to recover. My son had the worst time recovering, and his fever persisted much longer than anyone else’s. After the fever and nasty cough left, my son was different. He’d become defiant and disrespectful. And he had a weird new habit of making a soft sighing sound in the back of his throat. I’m a good mom, but my son is a jerk. If I struggled with parenting my high-strung, hyperactive child, I had no idea how to manage a child with these new and worsening behaviors. What do you do with a child who refuses to obey and does not respond to ANY form of discipline? I figured if I just got firmer with my son, he’d straighten up. When he was six, a light swat to his behind resulted in him slamming his door on me and hurting me. I knew then that corporal punishment would never be effective for this child. When we had friends over to play, he was mean to the other children, and would hurt them and call them names. I was horrified and so ashamed of what other moms must’ve thought of me. I was doing everything I knew to help my child: he was already on a strict diet and I enforced rules as best I could. I felt so helpless as his behavior worsened. I kept thinking there was something wrong with me. I wasn’t consistent enough. I wasn’t strong enough or firm enough. But the truth is: there was something wrong with him. I began putting the pieces together and realized he had every symptom of oppositional defiant disorder. It wasn’t until some time later when a stool test showed he had an abundance of strep bacteria in his gut that I knew it was PANDAS disorder, and despite the clueless doctor we were seeing saying it wasn’t PANDAS, I knew better. It’s not normal for a child to become incensed over the color of his plate. It’s not normal for it to take a child (particularly a very bright child- which he very much is) hours to write a single sentence. It’s not normal for a child to become so angry about being disciplined that he lashes out and hurts his parent. It’s not normal for a child to not be able to touch a paper towel because he can’t stand the way it feels, or certain clothes or bedsheets for that matter. It’s not normal for a child to have a meltdown about something minor, becoming so angry that you fear for his or others’ safety, only to have him flip a switch and become completely pleasant a short time later. It’s not normal for a child to make constant throat clearing or heavy breathing sounds, blink excessively, or have other strange, repetitive behaviors over which he has no control. 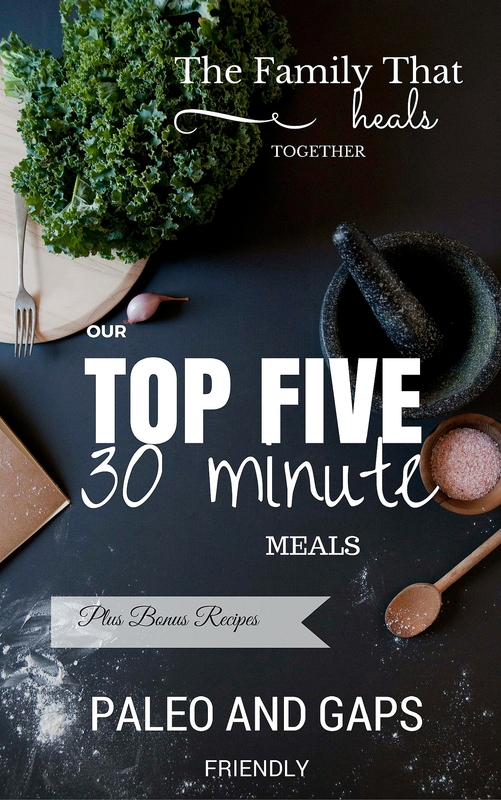 I could go on and on, but the point is, we battled all these behaviors (and worse!) for years while I beat myself up (truthfully, I still do) about it. If I was a good mom, why did my kid act like such a jerk? PANDAS kids can’t help it. 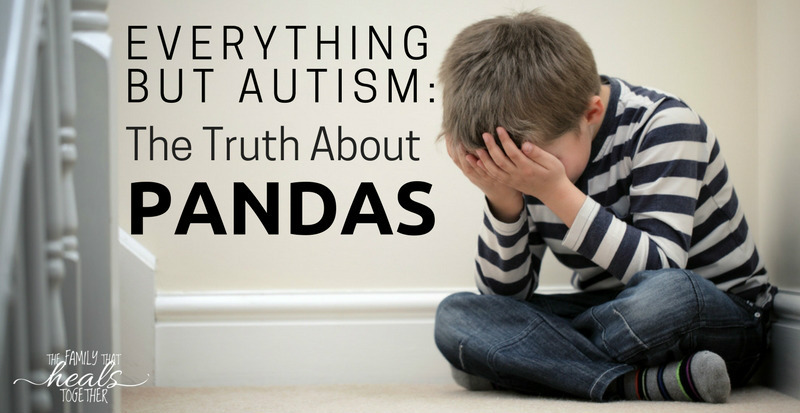 The truth is, kids with PANDAS disorder (or PANS) can’t control their emotions or behavior. Their brains are on fire. They simply can’t help it. That’s the truth. But here’s the frustrating thing, and if you’re a PANDAS parent, I know you know what I mean: PANDAS is hard to explain, particularly to those questioning both your parenting and your child’s behavior. While autism is a “spectrum” because symptoms and their severity can vary widely, many of those symptoms overlap with symptoms of PANDAS as well. Everyone knows what autism is, and lots of folks sympathize with autism parents and give them a break for their kids’ behavior. And not that I’m trying to have a pity party or anything, but I can’t exactly say “I’m sorry, my child has PANDAS.” No one knows what that means. And while both well-meaning friends and judgmental strangers have let me know that what my kid really needs is a swat, what they don’t know is that my kid can’t help it, and I really am doing the best I can. Besides, a swat wouldn’t help anyway. Thankfully, PANDAS doesn’t have to be forever, and if you find a knowledgeable doctor, you really can heal it. We’ve gotten rid of the symptoms before using natural remedies, but because PANDAS is such a complicated and persistent disease, we’ve decided to incorporate some conventional methods at this time. Neural Balance for calming. Using a high concentration of passionflower extracts to help the brain create GABA, Neural Balance helps to improve focus, lessen aggression, and improve sleep, anxiety, and social behaviors.​ I’ve found it especially necessary as my son has been on an antibiotic and his little body is waging a war inside against invaders, resulting in worsening of behaviors. Pooper for bowel function. I adore BioRay Kids formulas, and my son is almost always on at least one or another. At this time, as we are killing off the bad guys in his body, it’s really important to be sure his bowels are moving every single day. A gentle but effective probiotic for gut health. The probiotic I most often recommend, particularly for children with PANDAS, is GutPro. GutPro was designed with sensitive kids like those with PANDAS/PANS in mind, and it’s a great formula to try. Get it here. Florastor saccharomyces boulardii to keep yeasts balanced. When one is on antibiotics, the flora can become imbalanced and opportunistic yeast like candida can take over, creating a whole new set of problems. Saccharomyces boulardii is a good yeast which helps to keep candida under control. Adrenal and sleep support herbs. Attacking infections is hard on the body, so I’m supporting my son’s adrenal glands and sleep using herbal remedies. I give him my homemade adrenal extract as well as BioRay Kids Sleepy, or sometimes vary with other herbs, depending on what he needs. While these natural remedies help with some of the symptoms, what we really needed at this point was a doctor who was knowledgeable about PANDAS disorder. We’ve been so fortunate to find such a doctor (who, by the way, did confirm a PANDAS diagnosis) and, though it’s been a rough month as we’ve navigated treatment and I’ve gone from trusting only myself to treat my son’s symptoms to relying on a doctor who knows much more than me, I’m confident we’ll finally resolve this horrible condition once and for all. To find a PANDAS specialist near you, look at this list of US providers. 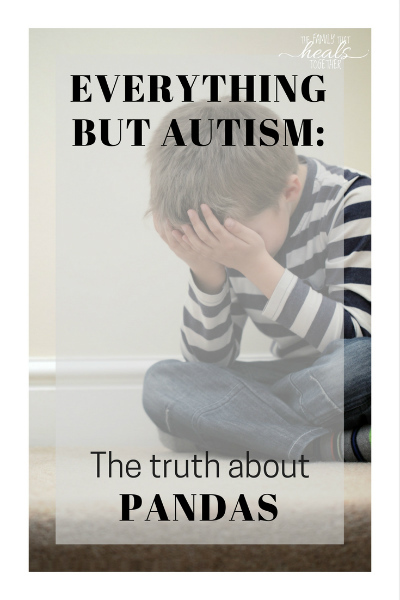 Does your child have PANDAS disorder? How have you navigated this tricky disease? Thank you for sharing your story. I am sorry you all are going through this. Please know that you are helping so many people by writing about your experiences. I am a pediatric nurse and have friends whose children have PANDAS and it is through parents like yourself that I have been able to learn about it. I always pass info on to my colleagues too so that we can educated more medical professionals. I applaud your tenacity and your fierce advocacy for your son and I hope he recovers from PANDAS soon. I also hope one day soon that all medical professionals will be capable of both recognizing it and successfully treating it. Keep writing and sharing please! Thanks you so much Vikki! Blessings. Excellent article. Yes through autoimmune disease/molecular mimicry, the body produces antibodies to the infection that mistake human protein receptors amino acid chains for invader and the neurological damage/encephalopathy begins, but also demyelination of myelin sheath can occur as well resulting in motor and speech issues. My son is Autistic. I have been reading studies for years, and had figured this out. I believe younger children experiencing PANS/PANDAS often receive Autism diagnosis, yet older children are given PANS/PANDAS if they get the correct diagnosis but are more liklely to get other labels incuding bipolar, ADHD, ODD, etc. A friend of my neurotypical son was straight A student and athlete, and at 15 he suddenly developed PANS…. Don’t know for sure if catalyst was he was ill, or he was vaccinated for school attendance due to SB277 mandatory vaccines. Timing was such that I would suspect it was a vaccine that put him over the edge and caused the encephalopathy and all the symptoms, but he could no longer function nor attend school. He was treated at Stanford PANS/PANDAS clinic and improved. But it sure sounded like Autism. All of the psychological labels have underlying physical illness and neurological damage as root cause. Many children and adults can improve and even recover when the correct biological interventions are put in place. Thank you for sharing your story so well! Thanks Erica. Nice to hear from you and thanks for sharing your story! I believe one of my sons (6 years old) has PANDAS. We haven’t yet begun to seek a diagnosis or treatment. I only really started believing he has it over the last 2 mo. and our local Children’s Hospital has a research and treatment center, but the waiting list is at least a 6 mo. wait at this time. He was diagnosed with non-specific ASD 2 years ago. He is semi-verbal, has bouts of uncontrollable yelling, screaming, crying, and self-injurous behavior. He often strikes himself on the sides of his head and face so hard it bruises, and kicks himself in the shins with his heels. We felt the need to have him seen by a doctor who could witness this behavior and write a letter to protect both him and us from being targeted by child services. He also has vocal and motor tics, and OCD type behaviors. Even as a baby he seemed, well, a little off. Then shortly after his 2 yr. vaccines, he developed a few really nasty cases of diaper rash, followed by a tenacious case of cellulitis on his thighs. This was never tested to see what kind of bacteria was present, and written off as a staph infection. The cellulitis came back a few more times, and diaper rashes were frequent, as well as constant loose stools. During all of this was when his emotional state began to climax, his OCD behavior got worse, and obvious learning disorder began to appear. Over the years we came to the realization that illnesses were a major trigger for him, but we’ve only recently learned of PANDAS and have him tested for strep every time his behaviors seem to surge. Guess what, every test in the past 6 mo. came back positive for GAS. So now we are nearly certain that the antibiotics aren’t getting rid of it. I almost wonder if he wasn’t born with it, or got it shortly after birth, which would likely mean that his father and/or I are carriers. We have 3 other children. His older brother has also gotten a diagnosis for non-specific ASD, and the younger 2 seem very neurotypical so far. It may be coincidental that we chose not to vaccinate the 2 youngest due to fears of an autism/vaccine link, which I’ve always been on the fence about, but my husband is not and I respect that. I mean, who wants to raise 4 children with ASD even if there’s a chance it may or may not be true, let’s be real here. None of them have the same symptomology as our 6 year old, so we haven’t tested the others yet for strep. I hear it’s becoming more common to treat entire households simultaneously. I came across your blog on Pinterest and this is maybe the 4th or 5th post I’ve read consecutively. I feel like you’re describing my family so much. Just shy of 2 years ago my son got a mysterious respiratory illness, the drs couldn’t get him healthy, it took weeks, they were worried about me having his little sister before he was well. They gave him albuterol for the cough and he has never been the same. Friends said his behavior would get better with age (he was 2.5), he’s nearly 4.5 and everything has only gotten worse. He too displays ODD symptoms and I can no longer handle him most days (today included). Every once and a while I get glimpses of my sweet happy boy but he’s quickly gone and I miss him. He already eats fairly clean, he has food allergies to dairy, egg, and nuts so he’s limited, but wheat is our weakness. I have more hope from your posts in cutting wheat/gluten and working on healing his gut in similar ways as you’ve explained. We’ll still move forward with scheduled dr visits to narrow down what’s going on but I’ll definitely be asking about PANS/PANDAS now. A hearty THANK YOU, and I wish you and your family all the best. Hi! Thanks for sharing your experiences. I am wondering if you have tried the full therapeutic detox protocol with Bioray? I see you mention a lot of the supplements (we’ve seen noticeable improvements with bioray as well) but in particular wondering if you’ve done the full protocol. Thanks! We have not yet, but may do so in the spring. Thank you!! I suspect we may be dealing with this as well. As a parent, how do you stay calm with they are oppositional and defiant? I find myself getting sucked into the anger and reacting in ways that are less then helpful. Also, for the neural balance with natural flavors- did you find that that was a trigger? Is it derived from corn? Thanks for this post. My friend recently worried her son had PANDAS. I’d heard of it before from my early days as a new mom who Googled everything. I felt a lump in my throat as I read the symptoms this time around – because they matched a behavioral regression of my almost-5-year-old all too well. I can’t pinpoint any illness to the onset (we were in a daycare center, so we always had germs fall through spring) but we have recently gotten a strange and similar “everything but autism” type of assessment from our school district’s team of specialists after 1.5 years of increasingly challenging behavior. I will be sure to pursue this with our pediatrician at the next appointment, if not sooner! I notice you are aware of the GAPS diet protocol. Did it not help completely? Best of luck to you! Symptoms go away when we adhere to the diet, but if we transition off, they come back, though every round of GAPS intro we do brings deeper healing and the symptoms ease more and more each time. My daughters symptoms are far worse in the week when she has school, and yet at the weekends when her dad is at home she is much better, the symptoms subside a bit…could this still be pandas ? Yes, definitely. School buildings are notorious for mold and harmful chemicals, not to mention, she’s in a classroom full of children all sharing their germs. The fact that she reacts at school and is better at home indicates PANDAS/PANS to me. You’re better off finding a functional medicine doctor or PANDAS specialist rather than going to a pediatrician, as pediatricians are not well-versed in PANDAS and will likely be little help. Thank you so so much for writing this. Being a PANDAs family is incredibly isolating. We have wonderful friends and family and yet we feel like we’re on an island because no one could possibly understand what it’s like to live with this day in and day out. Praying for healing for our family and yours and all PANDAs families. Thank you Melissa! It is isolating for sure. It’s always nice to know we’re not alone. Thank you for being open about your PANDAS journey! We are presently just looking into the possibility of our son having PANDAS, and going onto our first onslaught of antibiotics. I am very interested in the other posts, and will be reading it. My son is 11 and has been diagnosed with a barage of things…ADHD, High functioning Autism, Sensory Processing Disorder, Tourette’s, OCD and even possibly symptoms of schizophrenia. It is a battle…for his poor mind. He has had months of non-epileptic seizures, MRI, EEG, and CT scans…it is crazy. He also has asthma, allergies and so on, that all contribute to the giant blizzard that is attacking him. Oiye!